Buster Cleveland began producing his ART FOR UM mail art series in the late 1980s, mounting collaged images of celebrities alongside visual references to pop culture and art history on five-inch-by-five-inch squares of foam core. In a series totaling roughly sixty postcards, Cleveland presented his recipients with physically and conceptually layered works based loosely on the covers of contemporary Artforum magazines. He combined images of the original covers with his own magazine clippings, photographs, and other ephemera, before scaling each one down to postcard size using a laser printer. The final printed images were attached to foam core backings and adorned with the recipient’s address, rubber stamp markings, texts printed on paper, and handmade postage stamps—which Cleveland adhered alongside regulation United States Postal Service stamps. Anyone was able to sign up to receive Cleveland’s ART FOR UM collages through the mail, for a fee of $100 for a yearlong monthly subscription or $1000 for a lifetime subscription. This democratic system provided those interested with relatively inexpensive access to an original body of work. The nature of this means of distribution reduced the sense of preciousness typically associated with fine art works; Cleveland’s collages were handled by multiple people and passed through postal service bins, boxes, and sorting stations. In addition to producing the ART FOR UM series from collaged images of Artforum magazines, Cleveland turned the magazine covers themselves into art works. Often more minimal in style than the smaller squares meant for distribution, the original Artforum covers served as canvases for collage works. Ultimately encased in resin, the hardened objects could be hung on the wall or displayed on a plinth, acting both as image and object. 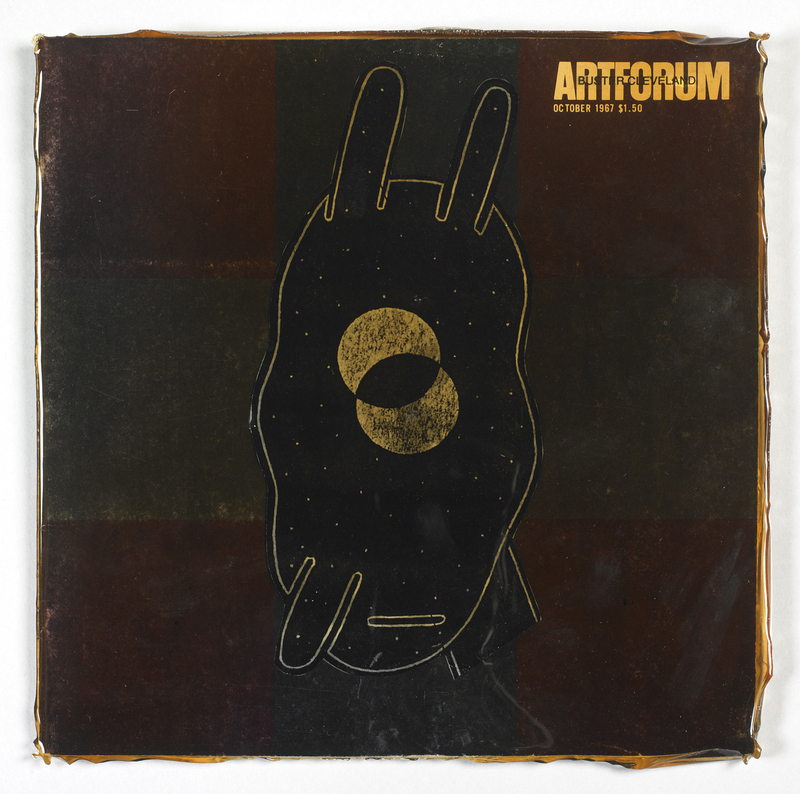 In many ways, the resin-coated Artforum covers can be viewed as maquettes for the ART FOR UM foam core works—they are simpler versions of the mailed pieces. Yet Cleveland seemed to regard the resin magazines as art works in their own right. They were presented in exhibitions, and there are many resin magazines that do not have a counterpart in a foam core version that was eventually mailed. The October 1967 Artforum cover, made in 1993 and included here in the Art=Text=Art exhibition, falls under this category—it is a stand-alone object that was never turned into an ART FOR UM piece. Titled Ray Johnson, the work pays tribute to the renowned mail artist, one of Cleveland’s major influences. The original Artforum cover features a painting by Ad Reinhardt, with whom Johnson served as an assistant in the 1950s. Cleveland then collaged a one-eyed figure on top of the image, perhaps alluding to Johnson’s own art, and printed “Buster Cleveland” on top of the Artforum logo before coating the entire work in resin, entombing this monument to his mentor. Cleveland died in 1998 at the age of 55. He is remembered for his associations with the renewed Dada movements of the 1970s and for his later mail art. He was born James Trenholm in Chicago and studied at the Chicago Art Institute and the San Francisco Art Institute after serving in the US Coast Guard. While in California, he became associated with the Mendocino Area and Bay Area Dada movements, California organizations of artists whose intentions were to recreate the ephemeral works of early European Dadaists like Kurt Schwitters and Marcel Duchamp. Influenced by Ray Johnson, Cleveland began working with mail art in the 1970s and moved to New York during this time, living bi-coastally throughout the 1980s. 1. John Held, Jr., “Before Punk and Zines: Bay Area Dada,” Stendhal Gallery, 21 March 2010, http://www.stendhalgallery.com/?p=3504. Buster Cleveland (b. 1943, Chicago, IL, d. 1998, Queens, NY) studied at the School of the Art Institute of Chicago and the San Francisco Art Institute. Cleveland’s ART FOR UM mail art subscription series (1980s) is considered by many to be his most notable work. Cleveland had his first major solo exhibitions at the Gracie Mansion Gallery, New York (1987, 1990, 1993). Cleveland’s most recent solo exhibition was held at Pavel Zoubok Gallery, New York (2012). Cleveland work can be found in the public collections of The Museum of Modern Art, New York; the Solomon R. Guggenheim Museum, New York; the University of Iowa Libraries, Iowa City; and the International Collage Center, Milton, Pennsylvania. Lauren Marinaro is the Director at the Zach Feuer Gallery, New York, where she works with young, emerging, and mid-career artists. The gallery works with art across all genres and mediums including video, painting, photography, performance, installation, sculpture, and conceptual works; as well as historical exhibitions including Signed, Sealed, Delivered, which Marinaro curated. Marinaro is an adjunct professor at New York University, where she most recently taught Understanding Contemporary Art: The Essential Guide to New Art and New Media. She completed her BA in Art History at the University of Richmond, Virginia, and received her MA in Contemporary Art from Sotheby’s Institute of Art, London. John Held, Jr., “Before Punk and Zines: Bay Area Dada,” Stendhal Gallery, 21 March 2010, http://www.stendhalgallery.com/?p=3504.